Louisville, Ky. – The Greater Louisville Association of Realtors (GLAR) reported year-to-date sales up 12.7 percent with 12,442 homes and condos sold versus 11,035 at the same time last year. Sales were up 17.7 percent in September 2015 (1,444 units) compared to September 2014 (1,227 units). The median price for all areas in September 2015 was up 1.3 percent compared to September 2014, and the year-to-date statistics show a 5.8 percent increase in values. 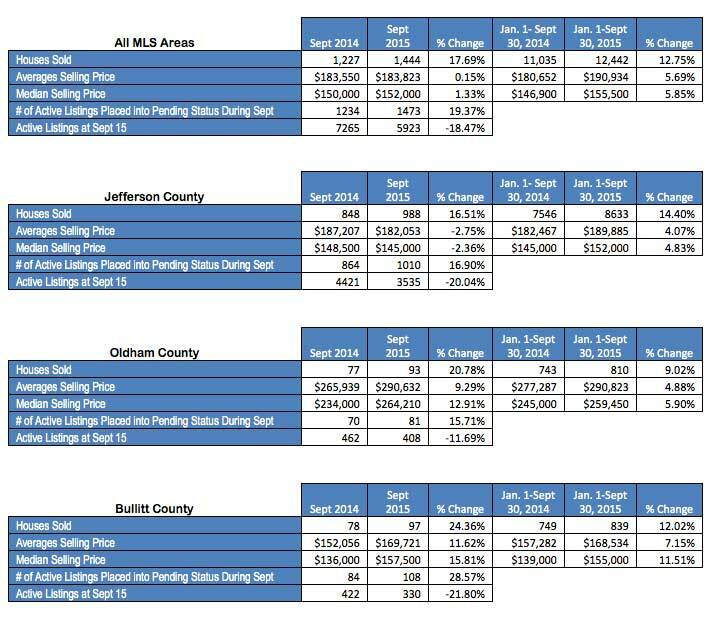 In Jefferson County, the average price was $182,053 and the median was $145,000. For all MLS areas, the inventory of available properties was 18.5 percent lower than at the same time last year. GLAR releases monthly statistics mid-month to allow for the most accurate and comprehensive reporting possible. Local REALTORS report their residential sales totals to GLAR, and publishing the statistics mid-month allows for the activity that takes place late in the month to be counted. This ensures that the totals reported show the truest depiction of the local housing market. At the national level, Lawrence Yun, Chief Economist for the National Association of Realtors (NAR) commented that, “Pending homes sales have leveled off since mid-summer; however, contract activity is still higher than a year ago.” He also remarked that adapting to the new CFPB mortgage rules could delay some sales this fall. This entry was posted in Kentucky-Wide News, Louisville-Jefferson County News, Mayor's Community Conversations.